Book of the Week Book of the Week: A Pick by Forrest Soper Forrest Soper selects Alone Together by Martino Marangoni as Book of the Week. Alone Together. By Martino Marangoni. The Eriskay Connection / Danilo Montanari Editore, 2014. 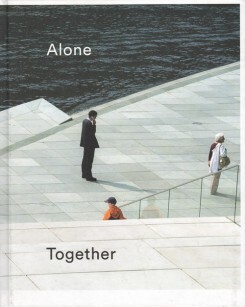 Forrest Soper selects Alone Together by Martino Marangoni from The Eriskay Connection / Danilo Montanari Editore as Book of the Week. “In Alone Together, Martino Marangoni captures the bizarre relationship between contemporary urban architecture and the individuals that inhabit it. Compiled from over eight years of shooting in cities across the globe, this book focuses on the moments of solitude people create as they occupy public spaces. The people are detached and reserved, their environments are minimal and exposed, and the end result is a social commentary that requires some investment to fully appreciate. There is a stillness to these photographs that is seldom seen in contemporary urban documents. Not a single individual in the book makes direct eye contact with the photographer. Instead, every citizen seems engrossed in their own world, uninterested in the others they share a space with. Men stare solemnly off into the distance, a blind woman walks across an empty street, and people of all ages are engrossed in their cellphones and tablets. Even when individuals are in small groups, a strong sense of detachment is still present, as they seem unconcerned with anyone they are not currently engaging with. Throughout the book, these individuals seem isolated, despite the open and revealing nature of the urban landscape. It should be noted that these environments, rather than the portraiture, is arguably the most important aspect of this book. Marangoni has noticed a fascinating trend emerging in modern architecture. In larger municipalities, there seems to be a pull towards designing structures that have a sense of openness about them. Massive glass windows have replaced walls, and buildings seem surrounded by vast expanses of flat concrete slabs or stone tiles. As a result, it is becoming harder to find seclusion in public spaces as architecture becomes more revealing and open. This change is well documented throughout this book, as the colored environmental portraits are interspersed with black-and-white images of construction sites. In these images, you can see evidence of ‘open architecture’ being created. Marangoni seems to suggest that this cultural phenomenon will only become more prevalent as time progresses and as more revealing structures continue to be made. Alone Together. By Martino Marangoni. The Eriskay Connection / Danilo Montanari Editore, 2014.